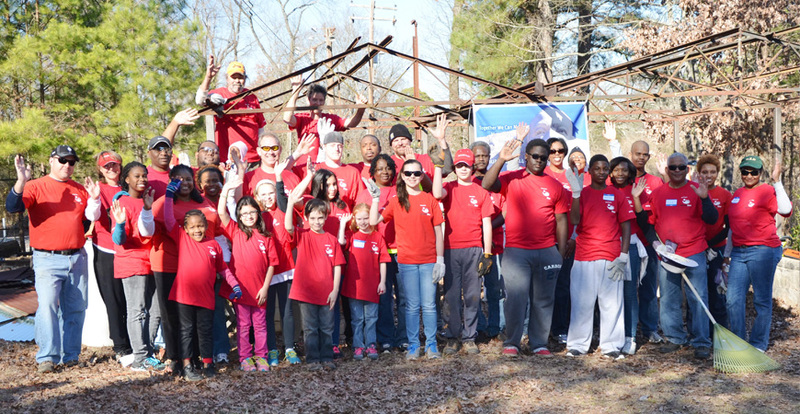 Staying involved with our community is critically important to all of us here at Honda Manufacturing of Alabama. That’s why we stand ready to make charitable donations, volunteer our time and lend a hand in any way we can. Here are a few ways we do our best to be a good neighbor. Martin Luther King, Jr. served as an inspiration to millions of Americans. Count us among those moved by his example. That’s why we partner with Hands on Birmingham to support the MLK Day of Service. Every year, around Dr. Seuss’ birthday, schools across our nation celebrate Read Across America Day. We participate by donating books and reading to young students. 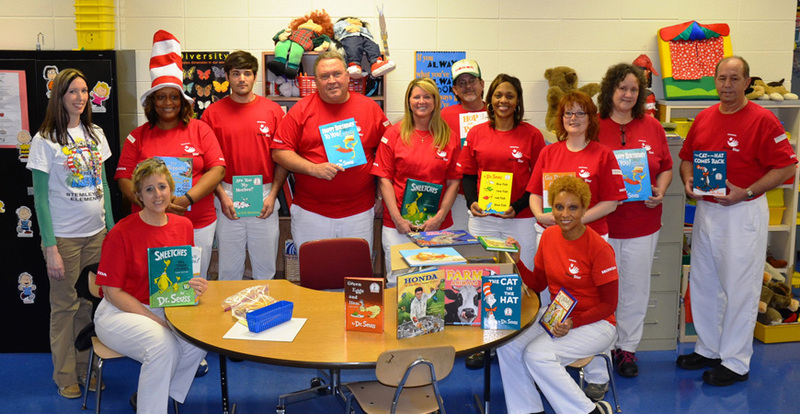 Every August our associates collect supplies for students at Lincoln and Stemley Road Elementary schools. 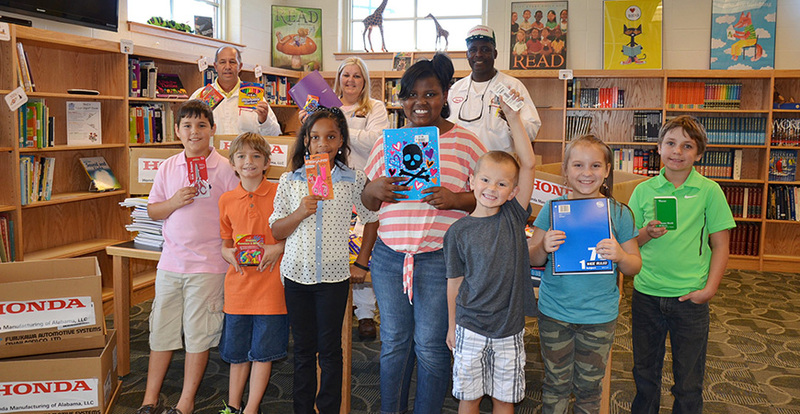 Last year, we collected more than 1,800 new supplies, including pencils, notebooks, erasers and more. ​The generosity of our associates comes out strong during our annual holiday toy and food drive. 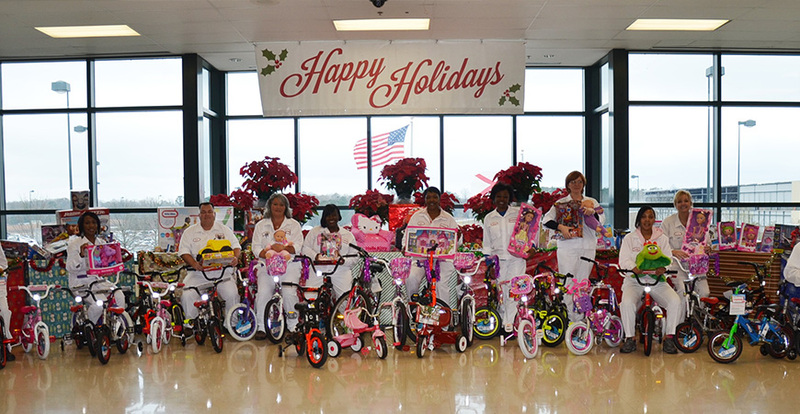 In 2013, we collected more than 3,200 items to help spread joy throughout our community. ​On April 27, 2011, tornadoes ravaged our state, affecting our community, our neighbors and people on our team. 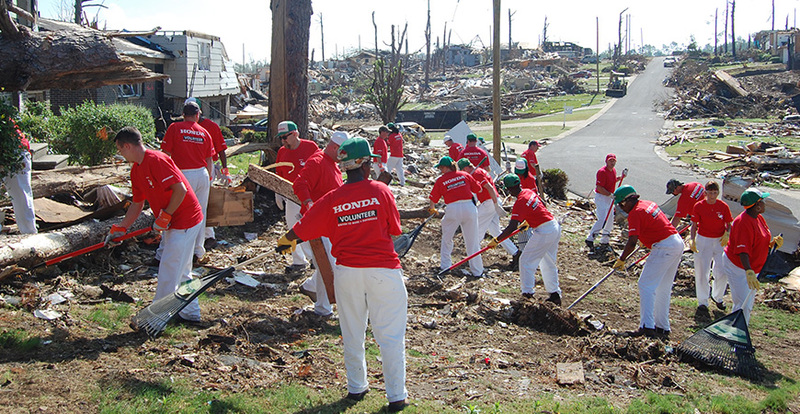 More than 1,500 of our associates put their time and efforts into assisting with the recovery. In addition, we donated food, blood, water, clothing, toiletries, and partnered with local nonprofits to help those in need. ​We’re proud to provide financial support to nonprofit organizations that promote cultural enrichment, respond to social needs and stimulate advancements in safety, diversity, youth education and the environment. If your organization’s values are in line with ours, follow one of the links to the right to request funding. For projects, programs or general operations. For luncheons, dinners and galas that help raise funds for nonprofit organizations. Honda Manufacturing of Alabama supports programs and organizations in the areas of education, arts and culture, civic and community, health, safety and human services and the environment. Priority consideration will be given for projects within the Central Alabama area where our associates live and work — Calhoun, Etowah, Jefferson, St. Clair and Talladega counties. In addition, Honda considers projects on a case-by-case basis outside this area if the projects reflect our priorities of interest. Honda Manufacturing of Alabama places its priorities on the support of programs — particularly education. We believe the best use of our funding is not so much in supporting annual operating budgets, but in supporting programs that can make a difference in the communities in which our associates live and work. Is this organization uniquely suited to meeting the challenge of the proposal? Will the program be carried out in an efficient and effective manner? Is the project budget complete and realistic? Are the objectives measurable? ​Click the Program Grant Application or the Event Sponsorship Application link. ​Complete the electronic application form and upload all required attachments, and you will receive a confirmation email. ​Receipt of grant applications and application status will be acknowledged via email. ​Requests are considered on a rotating basis throughout the year. ​Organizations may only receive a program grant for three years consecutively and must wait 12 months before submitting another program grant request. ​Applicants will be notified concerning a decision approximately two to eight weeks after submitting the application. Over the last 18 years, through the HondaStar and Volunteer Summer programs, more than 9,196 associates, friends and family members have volunteered more than 175,000 hours to local nonprofit organizations. The Team HMA volunteer spirit continues with HondaGO, a new five-hour volunteer program for associates, spouses and retirees that provides a $100 HondaGO Volunteer contribution to a 501(c)3 organization. For more information, please access the HondaGO volunteer guidelines and application form. United Way fills so many important needs for our community. That’s why our associates have been so passionate about contributing since we began production in 2001. And it’s why we gladly match 40 cents for every dollar given by our associates.